“You are the light of the world. A city situated on a hill cannot be hidden.No one lights a lamp and puts it under a basket, but rather on a lamp stand, and it gives light for all who are in the house. In the same way, let your light shine before men, so that they may see your good works and give glory to your Father in heaven. So let the sun shine in, face it with a grin. Every Christian ought to know that the Christian life is about letting the Son of God shine into and out of their life. I saw a cartoon, the other day, that showed a solemn seeker of Christ, who climbed to the very top of the mountain, seeking the deeper wisdom and knowledge. When he got to the top, Jesus simply said to him, "God back down there and love people." Did you know that smiling makes you feel better? Did you know that laughter is an antidepressant? Did you know that there is a spiritual law, that says that when you give, something will be given to you? Some people are more natural smilers than others. I have had seasons in my life where I was either very unhappy and did not smile much or smiled constantly. God actually took me from darkness into light and I had been very depressed, but God healed me and I was very joyous, and so much so, that people commented that I was a smiling person . I do understand depression and I do know about plastic smiles. I have learned though, that smiling is, to a large degree, a choice. We can choose to smile or not smile. People that frown often, who are otherwise "normal" are pretty much choosing to frown. I can not guess why they make the choice, but from my own frowning, or "refusal-to-smile-even-though-I-have-Christ-living-in-me", I would say it is a learned behavior, from inner workings having to do with our selves. Psychoanalyzing, asking, "why? ", is not my quest or point to make here. Another question that is relevant, because of who Jesus is and that he is in my life, is, "Did Jesus smile all the time?" There is a Jesus film, and in it, Jesus smiles most of the time. I can think of about three other Jesus films: and they range from having him not smiling at all, to having him smiling much of the time, but not always. It is a creative, speculative decision on how much Jesus smiled. He certainly was full of joy and love, but also serious and intense. Bono described his saying, "Let the dead bury the dead", as being punk rock. In other words, straight up, direct; not smiling. Every day, I have to walk down a long hall, from the parking structure, to my office. I walk past a lot of people, and many days I attempt to make eye contact and smile with as many as possible. And the reactions are diverse, but mostly positive. Smiling at people or even smiling and letting people see your smile, if they are looking; is a gift and a blessing. Despite all the entertainment and consumption, we really do not have a happy or joyful world. Many people live in authentic joy, but many do not. Happiness and joy are contagious. It is a good thing to share and spread. 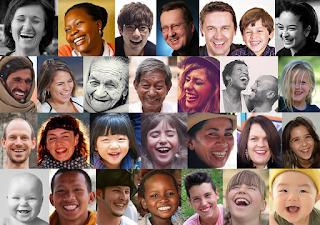 Everybody has the ability to turn from frowns to smiles, from gloom to happiness. One of the greatest gifts that every Christian carries, and we need to give it away as much as possible, is hope. Smiling signals hope. I have a lot to be thankful for and a lot to smile about, but the big one is that I am in love with Jesus Christ. I smile when I think about him. He is not like a simple love, but he is my savior and my king. He knows me and he is very good to me. I smile because of this. I do believe that this has to be cultivated and practiced. There are tons of things that the enemy does to try to rob us of our joy and our simple standing in Christ, where he loves us. We have to practice the joy. Our love can cool off, and the fire that burns within can dim. But it can always easily be brightened. Repentance like rest, is a lifestyle. There is a time to grieve and we don't smile the same way when we are full of grief. And we love people by weeping and grieving with them. But most of the time, is smiling time, because I am happy. Frowning and doing the gloom, anger, or arrogant sarcasm thing is what makes the enemy pleased; and is not who I really am, but a nasty caricature. Bye bye evil spirits, I am gonna smile.